Designed and built by Canon for the highest quality HD RGB processing, the DIGIC DV III Image Processor uses proprietary circuits and architecture to deliver exceptional image quality at the highest speeds, with low power consumption and minimal heat output. It processes the RGB image data - originating from the single CMOS sensor of the camera - into three channels (Red, Blue and Green) to maintain the rich resolution and clean color fidelity formerly possible only in three-chip sensor designs. The EOS C100 incorporates the first Canon CMOS sensor designed specifically for high frame rate motion pictures, offering not only high resolution and shallow depth-of-field but also high sensitivity with low noise. Working together, Canon's Super 35mm sensor and DIGIC DV III Image Processor achieve a remarkably high signal-to-noise ratio that enables recordings with great detail and dynamic range even in minimal light. Users will appreciate the camera's 12 stops of dynamic range at all ISO speed settings from 320 to 20,000. Canon Log Gamma preserves shadow and highlight detail for maximum editing and grading in post-production without degrading image quality; contrast and sharpness are subdued with characteristics similar to negative film. Canon Log Gamma emphasizes rich gradients from mid-range to highlights and realizes 12-stops of Dynamic Range (DR). At ISO850, Canon Log Gamma enables 5.3 stops of latitude above optimal exposure (and 6.7 stops below), broadening the available dynamic range in color grading. 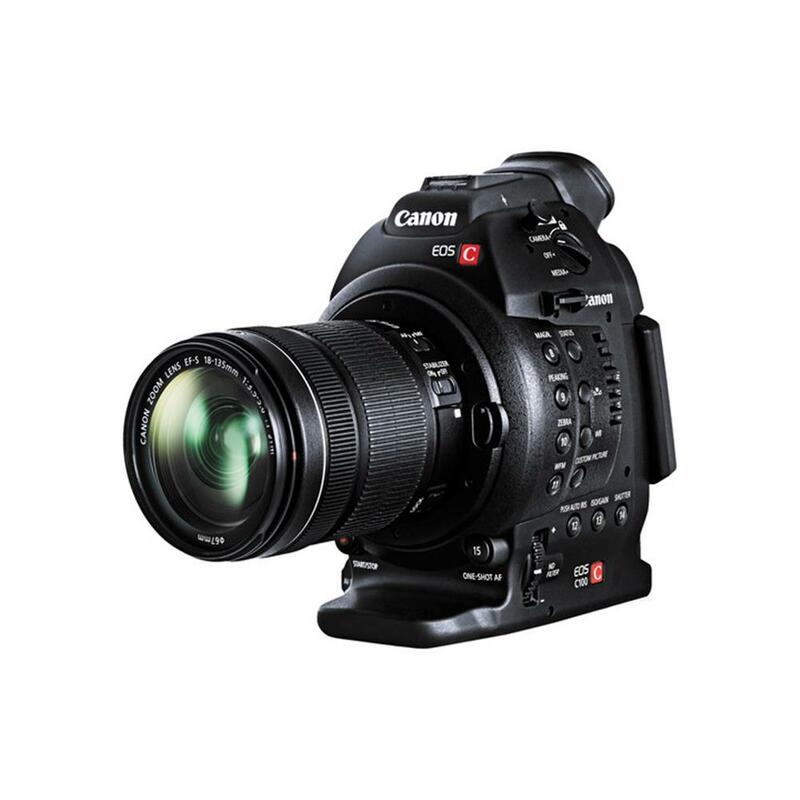 The EOS C100 supports shooting AVCHD bit rates up to 24Mbps (LPCM) at a maximum resolution of Full HD, 1920x1080. Frame rates of 60i, PF30, PF24, 24p, 50i, and 25p are all available for any number of production workflows. In addition, the 60i frame rate offers reduced rolling shutter artifacts for cleaner, more realistic images. The EOS C100 supports relay recording of long takes between dual SD cards or can write video to both cards for redundancy in the event of SD card failure. Pre REC mode buffers approximately 3 seconds before the tally light activates, instilling confidence that you have captured your take as you planned it. The EOS C100 offers complete manual control of each aspect of the recording process. Create and recall custom picture settings, camera functions, and display options. Built-in ND filters expand control over exposure, depth-of-field, and motion capture. Manual control of video and audio capture gives you the power to fully control what you capture. The EOS C100 is equipped with several powerful and intuitive focusing aids in both the EVF and LCD monitor that make it easy to confirm critical focus distance; Peaking Modes and Magnify Focus Modes are available while in standby or while recording. The EOS C100 also features the Edge Monitor Display on the LCD Monitor; green waveforms display the overall focus of the scene and red waveforms provide focus feedback of the three focus check boxes visible on the LCD monitor. The EOS C100 is designed with the single user in mind. It is 85% smaller than the Canon C300, 410 grams lighter, and it is based on a mobile core design that allows additional accessories to be attached depending on the situation. Strip the EOS C100 down for a "run-and-gun" style, or complement the camera with the full range of camera-mounted accessories. With a compact body, you can shoot dual-camera 3D without an outsized and cumbersome rig. Its light weight reduces user fatigue and allows even elaborate rigging systems to be mobile enough for a "crew of one." The removable accessory hand grip rotates 360 degrees for comfortable shooting positions, while customizable hardware buttons allow the EOS C100 to fit your own personal shooting preferences. One-Shot AF assists in focusing adjustment with a dedicated button. Focus status is confirmed on the viewfinder and monitor. Push Auto Iris automatically adjusts the aperture of the lens to quickly and easily maintain proper exposure, even in situations where lighting changes frequently. Run-and-Gun videographers and documentary filmmakers will appreciate the ability to start rolling without a protracted routine to establish optimum exposure values. Accurately assess focus, composition, and exposure with the 1.56 million dot-equivalent .24" Electronic Viewfinder with 100% coverage. The built-in 3.5-inch 920k dot LCD tilts 100 degrees for flexibility when composing tough perspective shots and rotates 180 degrees to protect the screen when not in use. Use the LCD display to review footage or to view the EOS C100's waveform monitor. The EOS C100 accepts a removable hand grip unit with built-in tally lights, stereo microphone, and dual XLR audio inputs for stereo recording. Audio is captured in 16-bit 48 kHz linear PCM format and each channel allows for independent gain adjustment. Attach a second microphone in the integrated mount, or power a wide range of audio capture devices with the dual XLR inputs with phantom power supply. EOS C100 records video to SD cards using AVCHD, a high-efficiency codec that has quickly become the standard in both the professional and consumer video markets. Maximum bit-rate is 24Mbps. Video files greater than 2GB are split into multiple files while recording, which are automatically joined together upon import using Canon Data Import. AVCHD video is widely supported across NLE systems and is the standard codec for Blu-Ray. The EOS C100 supports a variety of output media. Remotely control the EOS C100 via its LANC-compatible remote terminal. Remote operation allows for single-person operation even in creative rigging situations.